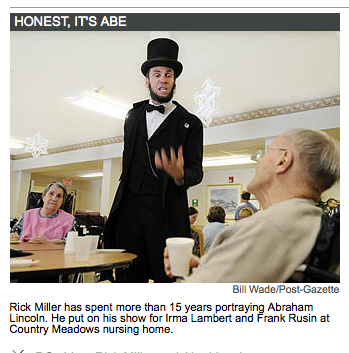 Holy crap, ABE! You’re supposed to be a thoughtful, soft-spoken man. You’re not supposed to look like you’re about to take a vicious bite out of some delicious brains. I have known Rick for many years. He’s quite the character. Oh well, At least it keeps him from setting around McDonalds drinking coffee..
Is that Mary Todd in pink? By the look of that picture I think he is just reading the notes on the palm of his hand..
Hey, he gets the five, too. Anyone else get two pieces of currency? Soooo….you wanna be in show biz, eh kid? Ya gotta do the makeup yourself, ya know. George Washington is on the quarter and the dollar bill. It appears Old Abe is telling the dude to back off whilst he hits on the babe in pink. I’m pretty sure he intends to twist the dudes nutsack with his 4 finger claw if he interrupts again. She’s like interested in dude across the room not Abe. Cue love shack music.